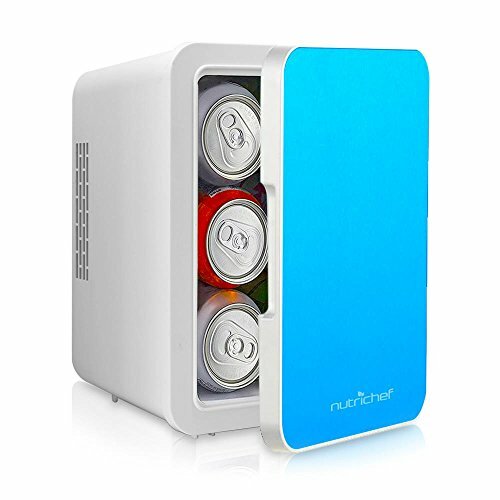 NutriChef’s compact and portable cooler/warmer mini fridge keeps drinks cool or warm and ready to serve. There’s a removable food tray for extra food storage use as well. It has a simple electric plug-in design and automatic temperature control too. Built with a rugged and durable construction that can hold a capacity of 4 Liter / 6 can. Cooling Temperature: 50°F Below Ambient Temp. COMPACT AND PORTABLE: This fridge box is very compact and portable. Lightweight, plus environmentally friendly polyurethane and integrated fan for temperature regulation, Simply use the switch for COLD and HOT or OFF. The cooling temperature is 50°F below ambient temperature and the warming temperature is 140°F. AC/DC ADAPTERS INCLUDED: The Cooler & Warmer comes with a wall cable + a car charger adapter, allowing you to power it on whenever & wherever you please. Put it on the deck/patio & then take it on roadtrips.